Star Trek Costume Guide: TNG jumpsuit analysis, part 2 added! 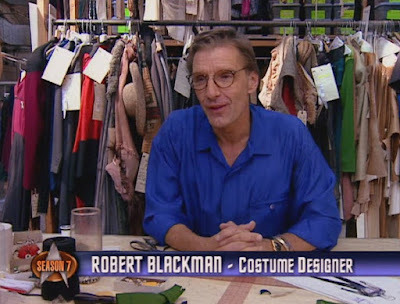 With this second installment of my TNG jumpsuit analysis, we hit the ground running with The Next Generation's third season and its then-new costume designer, Robert Blackman. Blackman, who would continue to preside over the Starfleet uniforms (and most of the costumes) for the remainder of the pre-Abrams franchise, inherited a sticky situation as costume designer; he and his department had to immediately design and construct new uniforms for the main cast while simultaneously handling the "aliens of the week!" But they also rolled up their sleeves, did the hard work, and churned out some beautiful and iconic uniforms which are not only still fondly remembered today, but still incredibly popular with fans and cosplayers! Blackman also seems to have loved constantly experimenting with his uniforms, tweaking this or that and trying new things on various characters. For instance, you probably know that the uniforms changed in The Next Generation's third season, but did you know that they began slowly changing again in its fifth season, arguably culminating in a new uniform "standard" by its final season?